A discussion with Jack Starnawski after his successful ascent of Denali (aka Mt McKinley) in Alaska. Jack suffered frostbite of the hands during the descent and now recounts his experiences with Nic Bendeli. Jack, can you tell us what spark prompted the idea to climb Denali? Your climbing partner was Tony. Did you both perhaps initiate the idea together? It was a follow on from a previous expedition. I was on Aconcagua a couple of years ago and had some ideas about climbing in New Zealand. During an NZAC Australian section trip to Blue Lake, I had a chat with Terry Cole about joining his planned Denali trip. Tony (Ruzek) simultaneously asked to join as well. Some time passed and we found out that we were unable to participate because Terry wanted to keep the team small. Eventually Terry pulled out and the trip fell apart. Tony was still keen, I was still keen and that is how it started. Can you tell us a bit about your background? Involvement in the outdoors? I have been involved in the outdoors for decades, at school I was hiking in the mountains and sailing, spent a lot of time outside the house. I was born in Poland and came to Australia as a twenty year old. In Australia I got married, started a family, and activities slowed down. Once the children were older, I started to become involved again. What are your favourite outdoor activities? Bushwalking, canyoning, skiing – originally alpine skiing was my preferred style. However a couple of years ago I became interested in backcountry country skiing. How did you go about finding other participants? The main driving force was Tony who advertised in the Sydney University Bushwalking Club (SUBW). That is how we found two members (Leo and Felix). The fifth member (Vova from the Ukraine) saw an advertisement somewhere and contacted Tony by email. How did you research regarding logistics? Equipment needed? Weather etc? I did a combination of research on the internet, reading articles and talking to people. I researched half a dozen guiding companies who worked in Alaska as well as the Denali National Park website. What specific training did you do in Australia so that the group worked as a team and skills specific to Denali (eg glacier travel, cramponing, crevasse rescue etc) were practised? 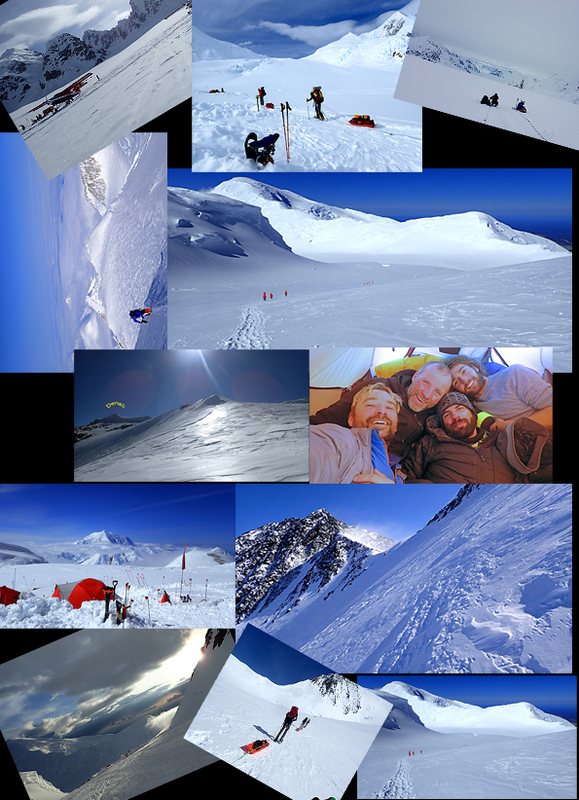 After researching the required skills for a Denali expedition I did an NZAC High Alpine Skills Course in New Zealand. I spend most of the weekends since the beginning of the year in the Blue Mountains doing canyoning and multidays hikes. I also did a couple of trips to the Snowy Mountains with the rest of the team to practice crevasse rescue during the last winter season. At Wahroonga cliffs we practiced team rope skills. Interesting to note that none of you had high altitude mountain skills. You found that with the basic skills practiced as described above you were able to ascend a high peak. Would you say that was a good summary? I had climbed some mountains in New Zealand as well as ascended Mt Elbrus (5642m Russia), Aconcagua (6962m Argentina), Mt Ararat (5137m Turkey) and few others. Aconcagua does not require technical skills however it did provide experience in higher altitudes. Denali is technically a relatively easy mountain. You arrived early May whereas usually parties move at the end of May or early June. Why did you climb so early and would you recommend others to do so? The first reason was to get there before the crowds started. The National Park has a quota of 1500 people/season. This way we would arrive early and ensure that we had a permit to climb. The difference in crowds between our arrival and departure was definitely noticeable. A second reason was climate change, the peak season used to be late June however now the best conditions are found towards the end of May/early June. If we were to do it again we would go at the same time. Can you relate a bit about the climb? When did you arrive at Talkeetna? When did you move to basecamp? How did the group move up the hill? We put into place a plan that was a copy of the commercial groups, about 21 days on the mountain. We arrived in Talkeetna and waited two days for the weather to settle before flying in to Base Camp. Once on the mountain we moved according to our schedule, there were no delays. We arrived at 11000’, 14000’ and 17000’ camps as per our schedule but at 17000’ we waited for a few days due to high winds. On the fourth day the weather turned sunny but windy. Four members of the team summited on that day. Two of us suffered from frostbite (toes and fingers). We contacted the Denali National Park (NP) and asked for assistance. We waited in our tents for three days because the weather was too bad for evacuation by helicopter. On the fourth day the NP sent a helicopter, however, it was unable to reach us because of strong winds. We decided to descend to 14000’ and wait for assistance. On the way down we met a rescue team on the Headwall, they helped us down to 14000’ where we waited again because of poor weather. On the evening of the third day, the helicopter was able to pick us up and take us to Talkeetna. We travelled to Anchorage where we received medical attention and made plans to return to Sydney as soon as possible. Where there any technical difficulties that required advanced mountaineering skills? Summit day was the longest and the hardest day of the expedition. The Headwall between 14000’ and 17000’ camps required very high level of fitness; otherwise the climb was not a technical one. The rest of the group summited later. Did they experience any problems? There were five of us and we all made it to the summit. Felix stayed at the 14000’ camp extra few days to improve his acclimatization before ascending to 17000’. He teamed with another solo climber from Turkey and they summited together a few days after we left the high camp. In the light of hindsight, what suggestions would you make to the Australian Section so that if you had to repeat the ascent, you would do it differently? I am already planning another expedition. Regarding the climb, I would improve my descent management. I was very fit and planned to go up and down fairly quickly. In future I would slow down and take more regular breaks. There are always conflicting ideas whether to travel in boots, snowshoes or skis. What did you use and how did you go? In our team we had four people with snowshoes and one person with skis. It all depends on your experience. The snowshoes were easy to use and most of the commercial teams use them. Above 11000’ it became steep and the snow was much harder; we used crampons from that point. Tony was a very keen skier and skied around. The hard snow surface and poor visibility made skiing less pleasant, sometimes it was just a fight for survival. I do not know if Tony would use skis again. I would certainly use snowshoes. The Australian Section congratulates you on your achievement and grieves with you on the partial loss of Tony’s toes and your fingers. Thank you for your help and cooperation in producing this article for the Australian Section newsletter. All the very best for future activities.